These are the show notes to an audio episode. You can listen to the show audio by clicking here: http://traffic.libsyn.com/airspeed/AirspeedGWLT28.mp3. Better yet, subscribe to Airspeed through iTunes or your other favorite podcatcher. It’s all free! 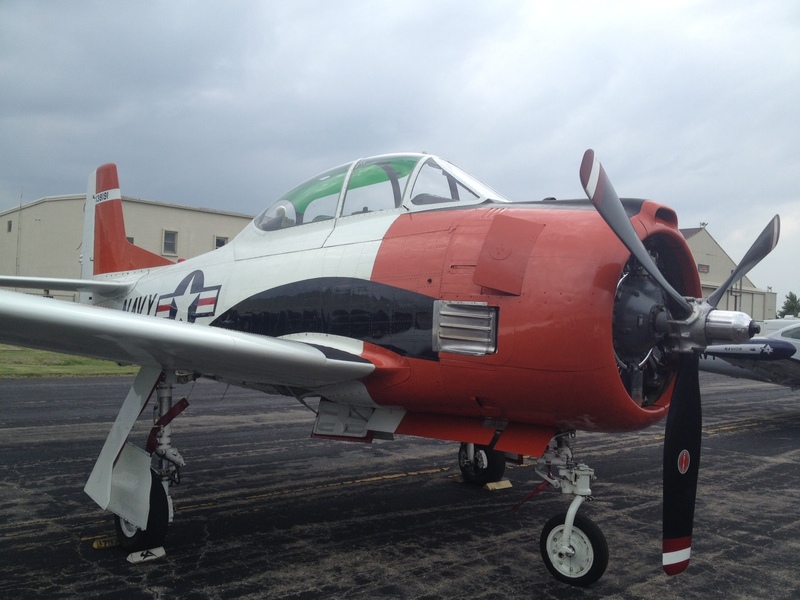 We waylayed Bill Whiteman on the ramp at the Gathering of Warbirds and Legends to talk about this particularly pretty specimen of the T-28 Trojan – a Navy trainer. These are the show notes to an audio episode. You can listen to the show audio by clicking here: http://traffic.libsyn.com/airspeed/AirspeedGWLYarberry.mp3. Better yet, subscribe to Airspeed through iTunes or your other favorite podcatcher. It’s all free! 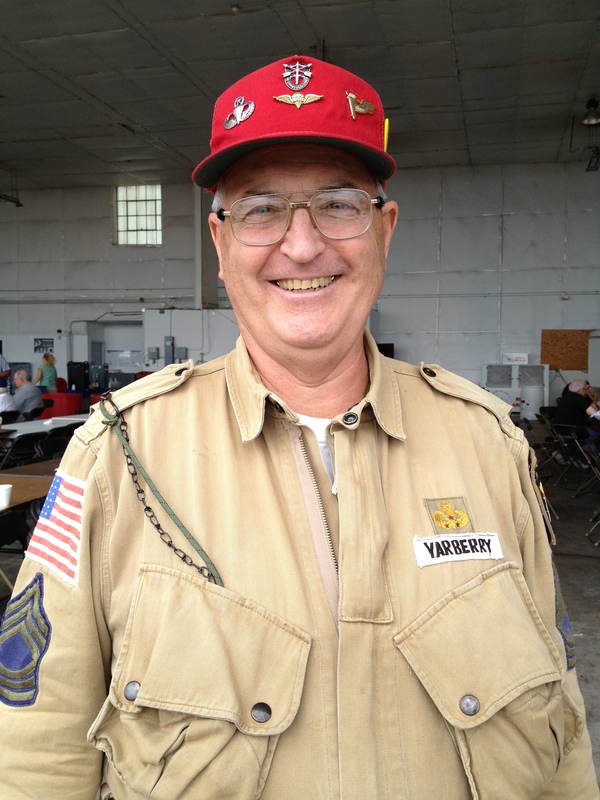 MSgt (Ret) Robert Yarberry is a commemorative paratrooper with the Airborne Heritage Platoon based here in Kansas. He took a few moments to talk to us about why a guy who could be taking it easy is instead out there doing PLFs under round canopies. These are the show notes to an audio episode. You can listen to the show audio by clicking here: http://traffic.libsyn.com/airspeed/AirspeedGWLBrief.mp3. Better yet, subscribe to Airspeed through iTunes or your other favorite podcatcher. It’s all free! The Gathering of Warbirds and Legends is underway here in Topeka. I sat in on the briefing this morning. Lots and lots going on and Dan and others covered everything from parachute deployments to warbird formation sequences. This might not be the best episode for those who like their podcast material in filtered and summarized form. There’ll be some of that later, to be sure. But, for now, you can hear what it’s like to attend the briefing at an utterly unique gathering of old iron. These are the show notes to an audio episode. You can listen to the show audio by clicking here: http://traffic.libsyn.com/airspeed/AirspeedB2withPreRoll.mp3. Better yet, subscribe to Airspeed through iTunes or your other favorite podcatcher. It’s all free! 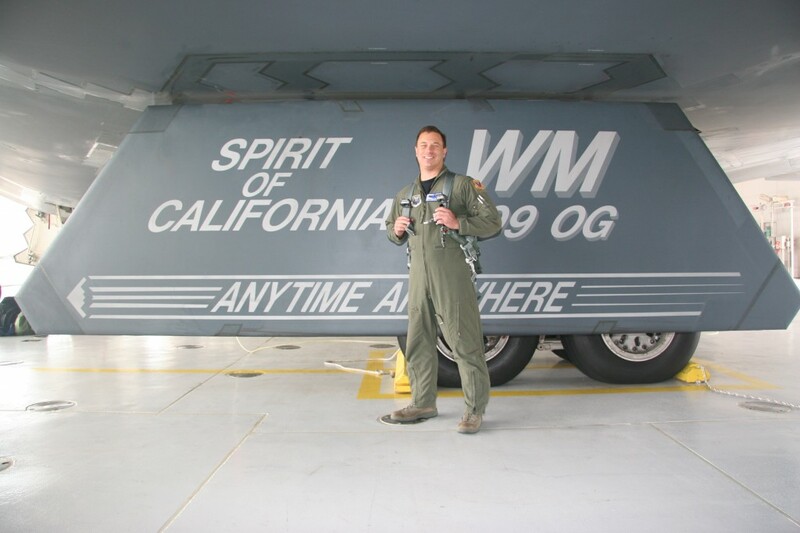 In 2010, Rod Rakic and I flew to Whiteman AFB near Knob Noster, Missouri (or very close thereto) to meet Lt Col Christopher “Cliff” DeVaughn, get a tower tour, and fly the B-2A Weapons System Trainer. It made an impression and I wrote it up in a blog post. If that sounds like a process that might lead to a pretty dry and superficial episode, you’d ordinarily be right. But, thanks to Cliff and the Air Force, this is a pretty rich and detailed look at the aircraft and the warriors who fly them. We talked about the aircraft, its flight characteristics, and its mission. And, more importantly, we talked about what it’s like to fly long-duration missions in one of the most important strategic weapons systems in the US inventory. All the way from the selection process through training and into combat. This is every bit as much about the men as the machines. And so, here it is! 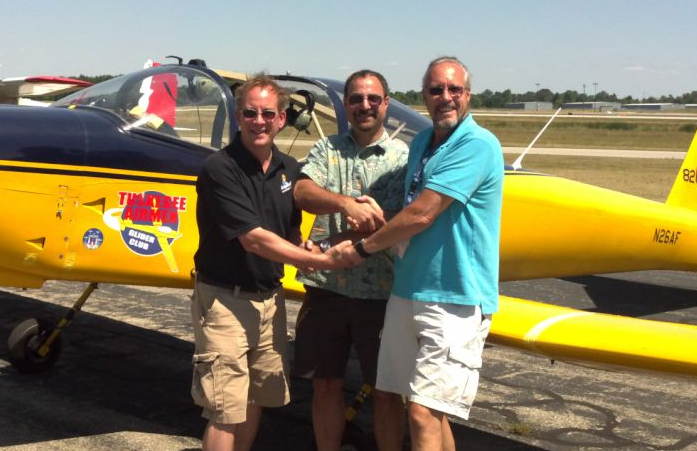 Another podsphere and new-media first right here on Airspeed! For more information about the US Air Force and officer recruiting programs, check out www.airforce.com. You can follow Cliff on Twitter or check out his Facebook page. Be sure to take advantage of Airspeed’s special offer from Audible.com! Click here and get a free audiobook as part of an Audible trial subscription. You get to choose from more than 100,000 audiobooks, Airspeed gets a few bucks, and everybody wins! 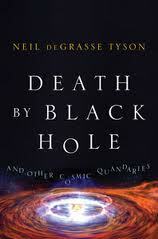 You can, of course, choose any audiobook you like, but Airspeed‘s suggested selection this time around is Neil DeGrasse Tyson’s Death by Black Hole, an anthology of some of Dr. Tyson’s most popular articles and other writings dealing with everything from spaghettification to the scourge of outdoor lighting. Neil doesn’t read it (as is obvious from the narrator’s screwups like pronouncing Saturn V as “Saturn Vee”), but it’s otherwise not hard to suspend disbelief and hear Dr. Tyson come through clearly. These are the show notes to an audio episode. You can listen to the show audio by clicking here: http://traffic.libsyn.com/airspeed/AirspeedGliderRating2.mp3. Better yet, subscribe to Airspeed through iTunes or your other favorite podcatcher. It’s all free! This is the second part of a two-part series covering my glider rating. To bring you up to speed, in March of this year, I began training in the TG-7A motorglider to add a glider rating. In May, I soloed the aircraft for the first time. Part 1 covered events up through the solo. On to Part 2. After the solo, things move more quickly. You’ve proven that you can operate the aircraft without the instructor aboard. Or at least that you’re so lucky that you don’t need the instructor. Same result. Now it’s all about the checkride. It’s not as though you haven’t been preparing for the checkride since your very first flight. But now is when you think about it a lot more. I bought Bob Wander’s commercial checkride guide. I borrowed some of John’s Harte’s materials. I looked (briefly) for commercial glider knowledge test prep software or online courses, but that was futile. I can perhaps forgive Gleim and the other test prep companies for not having a course tailored for commercial glider guys. We can’t be much of a market. So I paid for Gleim’s regular airplane commercial pilot ground school. It’s geared toward airplane pilots, but the regulatory review was bound to be helpful and I’ll probably go after the commercial for ASEL and AMEL soon anyway.